I always think of Splintered as a guitar-noise band, but listening back to Turned Inside Out it's apparent now that their scope went well beyond the likes of the guitar-noise associated with Skullflower and Ramleh (who when they do get remembered at all seem to get compared to most), usually due to the connection to Shock Records and for their predilection for pushing their vocals to the background. Sure the first disc is full of distorted guitar textures but those early recordings featured tapes and a prolific rhythm section, while the second disc sees Splintered moving into experimental realms, at points dropping the guitar altogether. In hindsight, although primarily a guitar-noise outfit with industrial proclivities Splintered appeared to explore new possibilities within the confines of a "rock" context, something that Richard Johnson has continued albeit in a different form with Theme. 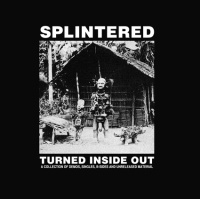 Although Splintered released between four and five albums (Parapraxis, The Judas Cradle, Noumena, Moraine and a split LP with Ralf Wehowsky) they're barely touched upon here as most of Turned Inside Out is taken from singles and compilation contributions along with unreleased tracks. It was those singles released in small editions on labels such as Shock, Dirter Promotions, Dying Earth Records, Aquese Recordings, Pit'sbull, Suggestion... and I should know as I've got most of them - that allowed Splintered to try out new things and, at times, to take the sound into more experimental areas. But on Turned Inside Out it takes a while to get to those new directions. That's not to say there's anything wrong with the tracks filled with guitar swirl, there's not; as most of Splintered's output is characterised by its controlled blackened riffing. You can almost follow the trajectory of Splintered in the first few tracks which originally appeared on the Tearing Down The Barricades compilation vinyl album with the opening cut, 'Last Laugh', taken from a demo, featuring a degree of post-punk experimentation amidst waves of guitar augmenting the anguished whisper and plodding bass, moving into Cure-like terrain on 'Land Fall' (a track which later resurfaced on Splintered's first album Parapraxis) cut with guitar noise and tapes. Both are interesting in terms of the genesis of the band, but Splintered really come into their own on the following tracks. The two cuts from their single on Shock carry monolithic distorted guitar and rhythmic drumming, with 'Nothing' capturing distant pulverised vocals amidst tapes, while the twin vocal attack of 'Breakdown, Part II' offers a more punky angle to the searing guitar noise and hyper rhythmic drumming. 'Pigmeat: Remix' is an alternate take of another track from Splintered's debut album with a psychedelic swirl and treated vocals, anchored to a rhythmic groove, while 'Candleskin', later to turn up in a heavier form on The Judas Cradle, crawls along to some monolithic whirling guitar riff, sounding like an amped up Loop with added distant holler and taped treatments. Both 'Undertow' and 'Godsend' make use of rattling chains in an industrialised fashion, with the thudding beats and noise approach of 'Undertow' more akin to noisenik compatriots Headbutt. 'Godsend', meanwhile, an alternate single take of a track from The Judas Cradle, lets loose with repetitious searing riffs of guitar noise and a hammering rhythm that gets caught up in a noise haze with those vocals pushed way back in the mix, just the way Splintered prefer. It certainly rates as one of the many highlights on Turned Inside Out. So too is 'Hilt' which bursts out of its noise intro into distorted riffs and some powerful drumming, with an interplay of pushed back Ramleh style vocals. I must confess, and it's something I never caught on to at the time was just how powerful the rhythm section of Splintered was, and how those rhythms propelled the sound. It takes until the fourth track on the second disc for Splintered to break free from the confines of a rock sound into other areas, as shown by a number of shorter experimental atmospheric tracks. Whether this was a result of the group looking to expand into other areas or if it was something to do with Steve Pittis of the dark ambient project Band of Pain joining the floating ranks I don't know but 'Outpost, Version II' is a gritty electronic and atmospheric piece laced with taped treatments. 'S.H.C.' is another experimental atmospheric track with reverberating electronics provided by the enigmatic and much-missed Somewhere In Europe (who also contributed to Splintered's The Judas Cradle). From these tracks it's clear that Splintered went well beyond your typical guitar-noise outfit. All those myriad element come together on 'Facelift' merging electronic rhythms, taped treatments and guitar noise, while the heavy riffing of '(Behind The) Smokescreen' is bolstered by some inventive "rock" drumming and free-form sax squall. 'Exercise In Denial' offers a rare noise onslaught delivered almost Consumer Electronics style. Aside from 'Nail Fetish' (The Judas Cradle) and 'Faceless' (Noumena), I really don't remember Splintered ever being this forceful and abrasive. And just as those tracks represent Splintered's occasional forays into noise realms the final track is another one of their atmospheric pieces this time taken from the final Splintered release. Merging drones, tapes, and percussion with an almost Eastern melody, 'Blood Orchid', foreshadows the approach that Richard Johnson would pursue on his next project, Theme.